Business expenses related to travel and entertainment (T&E) encompass 8%-to-12% of the average organization's total budget, forcing executives to implement next-generation strategies and solutions for driving down operational costs and improving visibility in both processes and spending. Automation and T&E expense management tools have proven to drive tremendous value from a complex spend category that grows more strategic in nature each year. However, for the average organization, shifting from a manual program to technology-fused processes may result in unwanted corporate headaches as solution selection project managers survey the vendor landscape for an ideal enabler. 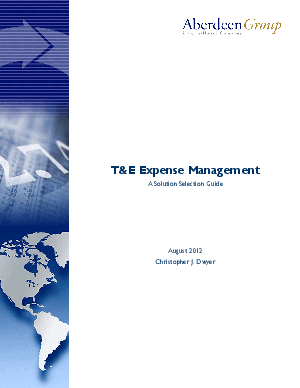 The T&E Expense Management Solution Selection Guide is a handbook for organizations that are embarking on the solution selection journey to replace traditionally-manual capabilities or move to an updated technology platform. This report will help guide those executives tasked with leading a solution selection program on the necessary components for building an effective team and understanding the technological landscape of travel and expense management solutions.